MONROEVILLE – Heritage hadn't faced a non-conference opponent in over a month, since losing by one point at Eastside on Dec. 29. 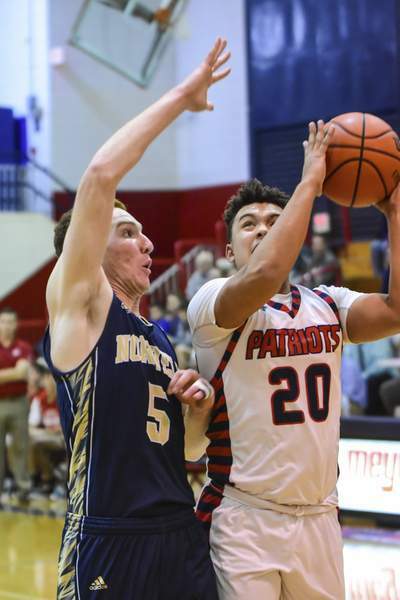 "We got out, and we were smart in transition," Heritage coach Adam Gray said. "We got some easy buckets, throwing it ahead, pushing it ahead, but we also had some poor turnovers by doing that as well. I thought we were a lot smarter in the second half about when we pushed in transition and the shots we were taking." The Knights jumped out to an 8-0 lead as Levi Leidig hit his first two 3-point attempts. That opening stretch proved to be the largest of the game for either side. Heritage quickly got back into the game as Jaydon Harris hit two 3s of his own and Geiger went to the bench after picking up his second foul. "Any time you can get a great player like that out with two fouls early, it's going to be helpful to the cause," Gray said. "For us, when he wasn't in the game, they had guys that stepped up and made plays." The Patriots pulled within 16-12 before the end of the first quarter and went ahead for the first time early in the second quarter on a 3 by Burton. In the final seconds of the first half, Burton blocked a 3-point attempt by Leidig, but Leidig grabbed his own rebound, took a few steps closer to the rim and hit a shot at the buzzer to tie the game at 22 at halftime. The teams traded baskets for much of the second half and with 1:20 to go in the game Burton hit another 3 – his third of the night – to put the Patriots up 45-44. Geiger hit one more go-ahead shot with just over a minute remaining, but his attempted game-winner with 10 seconds to go bounced off the front of the rim. Geiger finished with a game-high 19 points, nine of them coming in the fourth quarter. Leidig, who scored nine points in the first quarter, scored 16. 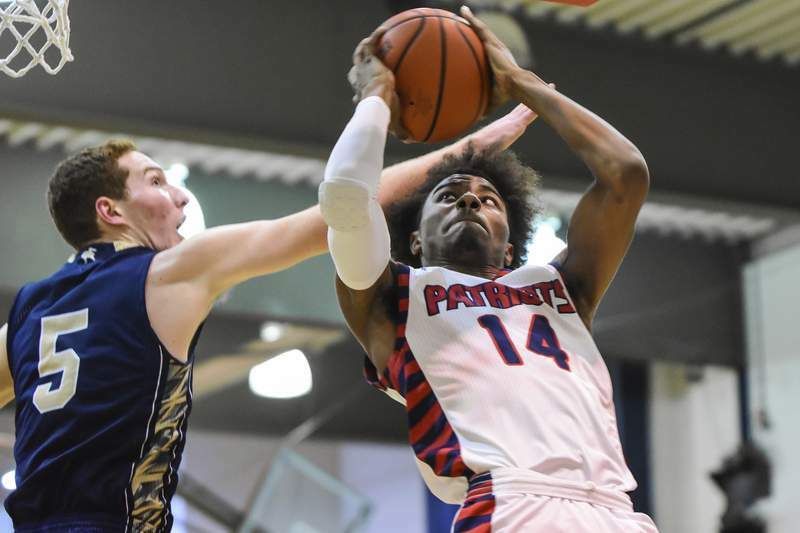 Jaydon Harris led the Patriots with 18 points and Cameron Mitchell scored 14. "It seemed like every time it could have gotten to a two-possession game, three-possession game, one of our seniors stepped up and made a play," Gray said. "Whether it was Walter Knapke, who takes a charge by Geiger to get that second foul on him. Alec gets big shots, Jaydon gets big shots early." Gray said the victory was a meaningful one for his team, which could face the Knights again in sectionals. "We saw it as a challenge, not only being a sectional opponent, but also an opponent that's our size," Gray said. "Except for Woodlan, we've played 2A and 1A opponents all January in the ACAC tournament and in the ACAC regular season. So for us to play a team that's that good and that size school, it was a big win for us, I absolutely believe that."